Synopsis: “The Fault in Our Stars meets Eleanor and Park in this exhilarating and heart-wrenching love story about a girl who learns to live from a boy who intends to die. For some reason it took me forever to read this book. Don’t ask me why… but I guess I just had such high expectations and I was so afraid of it not meeting these expectations that I seriously took my time finishing it. However, my reluctance to finish it did not at all reflect the quality of the book or writing. All The Bright Places is a beautiful, gripping and heart-breaking novel that tugs hard on the heart strings and tear ducts, that leaves you thinking well after you’ve turned the final page. 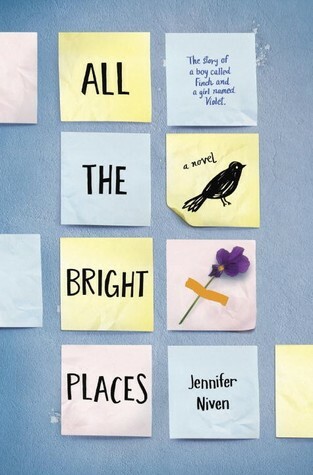 All The Bright Places is the raw, funny and heart wrenching debut young adult novel from Jennifer Niven. Niven seamlessly transitions from adult to young adult fiction in this beautifully composed tale about life, love and grief. Told from the dual perspective of the two main characters, All The Bright Places is a profound and soul piercing love story about a girl who learns how to live from a boy who wants to die. Violet Markey is struggling to live each day without her sister. Riddled with overwhelming grief and guilt, Violet longs to escape the memories and pain of the present. Refusing to focus on anything but the future, Violet is counting down the days to graduation and her imminent escape from the small Indiana town. Theodore Finch is a tortured outsider who is fascinated and obsessed with death. For him, getting out of bed and going about his daily routine is a constant challenge. Finch continually creates new ways to die, but still searches and hopes for something worth staying for. When the unlikely pair meet in the most unexpected place, six stories high on the ledge of the school bell tower, a unique bond is formed and the two begin a journey to save each other as they pair up for a school project to discover the ‘natural wonders’ of their state. On their road to discovery Finch and Violet unearth important lessons about life, themselves and each other, creating an unspoken promise to truly start living and cherish each moment, no matter how fleeting. This is an unashamedly honest portrayal of life and death. Niven successfully explores the struggles of high school, the challenges of navigating difficult family relationships, and the intensity of first love all while portraying mental illness and the effects and issues surrounding it. I loved the way Niven wrote these characters. Finch and Violet, while complete opposites, very much complemented each other and forced each other out of their shell and comfort zone. They lived these moments together, and helped each other realise there were many things, even small things, worth living for – a theme I found incredibly refreshing for a novel which focused mainly on depression and dealing with death. This really stood out for me. I find in some novels that deal with similar themes, often characters are portrayed in an ever-present cloud of sadness. And while this was obviously a focus of the novel, I appreciated Niven writing characters who really was trying to find reasons to live and work through their depression – subverting a very common YA trope that often irks me. I also found there was a certain realism to the characters that was really quite uncanny. It very much portrayed how certain situations affect not only the two main characters involved, but also the family – something I feel is often lacking in recent Young Adult novels that tend to only really specifically focus on the family after something major has happened. Even if there were small scenes here and there with family, it was really quite telling. I was hopelessly swept away by this moving and powerful tale. It was an amazingly realistic portrayal of depression and the aftermath of losing a loved one, and will stay with me for a long time. Definitely my favourite read so far of 2015, I would recommend All The Bright Places to absolutely everyone (i’ve already started the book pushing) as long as they have a box of tissues and chocolates on hand – this one’s a doozy!